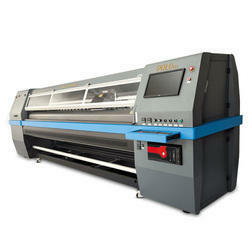 Colorjet Eco Solvent is a high quality photoreal large format digital eco solvent inkjet printer. Its unsurpassed image quality makes it ideal for highly detailed indoor signage.Colorjet Eco Solvent can also be used for high volume outdoor signage applications.Colorjet Eco Solventgrey scale print-head is powered by Variable Drop Technology that reproduces images of photoreal quality with astounding detail and color. Micro Piezo print-heads enable consistent quality across a wide variety of media including vinyl, flex, banner fabric, synthetics, PET, paper, film, canvas etc. All this translates into stunning, vibrant large-format images. 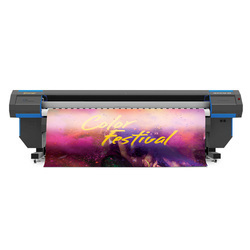 Enables clients to experience the full impact of next-generation large-format color printer performance. It include eco solvent printing machine , eco solvent printer , eco solvent machine, vinyl printer, vinyl printing machine , roland eco solvent machine. COLORJET is one of the largest manufacturer and exporter in INDIA. NEPTUNE HQ is high speed quality KONICA HEAD ECO SOLVENT PRINTER with unique specialty 4H-10-14PL(variable)-1024KM (MNB). Konica Minolta Japanese 1024KM (MNB), 4 print heads for Flex and Eco solvent. Printing resolution maximum up to 1440 dpi. RIP software Flexi Rip (Colorjet Edition). Eco solvent inks, 4 color (CMYK). Print type SAV, PVC Banner, Backlit Film, Window Film, Fabric (Solvent Base). Pre-heating, post heating & fan evaporative dryer along with Vacuum bed. Consistent jetting using AIVC technology. After sale service and 3 year's extended warranty (Condition Apply). Konica Minolta Japanese KM 1024i 4 print heads for Flex and Eco solvent. Print type SAV, PVC Banner, Backlit Film, Window Film, Fabric (sSolvent Base). Pre heating, post heating & fan evaporative dryer along with Vacuum bed. After sale service and 3 year's extended warranty (Condition). Impressive print speed and quality, advanced productivity features and unmatched reliability and support make the Versa WORKS RF-640 UV business. Efficient, reliable and affordable, the Versa WORKS RF-640 UV delivers outstanding prints day in and day out. For faster Production Dual UV LED Lamps for fast curing. To print on wide range of media like Wallpapers, Translite , canvas, vinyl, leatherite, Flex, Blinds and much more. In UV segment we call with various name uv roll to roll, uv printing machine, uv printer, wallpaper printing machine, vinyl printing machine , eco solvent printing application , digital uv printer roll to roll , digital uv printer. Colorjet is one of the largest manufacturer and exporter in INDIA. 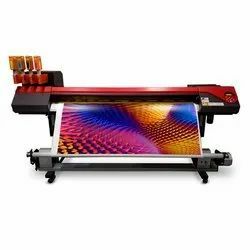 AURAJET II is high speed quality EPSON DX5 HEAD ECO SOLVENT PRINTER with unique specialty. EPSON Original Rank head, with 1/2 print head. RIP software Flexi (Colorjet edition). Media width 1900 mm, thickness 3.0mm with liner. Printing width maximum 1800 mm. Print type SAV, PVC Banner, Backlit Film, Window Film, Fabric (ECO Solvent Base). Pre heating, post heating fan evaporative dryer along with Vacuum bed. Add on Dye Sublimation kit also.